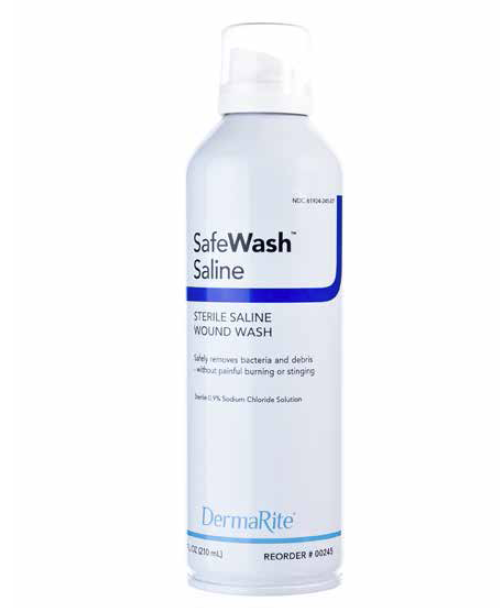 SafeWash Sterile Saline Wound Cleanser is a sterile wound wash saline spray. It provides a gentle and effective way to clean wounds. Sterile saline wound cleaner uses clinically proven pressure in order to remove bacteria and debris from the wound without causing any pain. The bag-in-can technology allows for the wound cleanser to be sprayed upside down. This wound cleanser is preservative free and drug free. These saline sprays are environmentally friendly, because they contain no CFC's, which deplete the ozone layer. The cleanser also causes no burning or stinging and is made from a 0.9 percent sodium chloride solution. Application of the sterile saline wound cleanser can be used for wound cleansing, skin/incontinent cleansing, scrapes, EMS, deep cuts, puncture wounds and first aid. 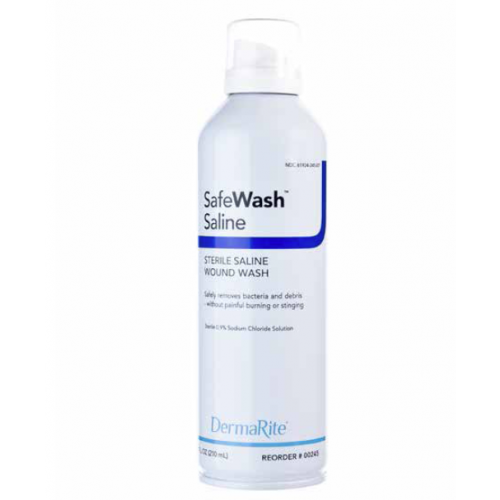 SafeWash Sterile Saline Wound Cleanser is sold in 7.5 oz cans and available in cases of 12. Sterile wound wash saline spray. Provides gentle and effective way to clean wounds. Uses clinically proven pressure to remove bacteria and debris from wound without causing pain. Bag-in-can technology allows to be sprayed upside down. Causes no burning or stinging. Made from 0.9 percent sodium chloride solution. Application for wound cleansing, skin/incontinent cleansing, scrapes, EMS, deep cuts, puncture wounds and first aid. SafeWash Sterile Saline Wound Cleanser Item number: 00245. Generic Drug Name: Sodium Chloride. No CFC's, which deplete the ozone layer. This product works great and is very gentle on the skin. Would recommend for any skin type. Spraying Saline upside down is a great feature. The SafeWash Saline Spray can be sprayed upside down making this wound cleanser of more utility than the competing sterile cleanser available. The additional feature of no stinging provides comfort for the patient being treated. No one likes pain!